Whether you are building a new home or remodeling your current kitchen, buying new cabinets can be a major and costly decision. With flat panel doors and Euro style cabinets becoming more popular, there are some interesting options out there for homeowners who are looking to save some money on a remodel. 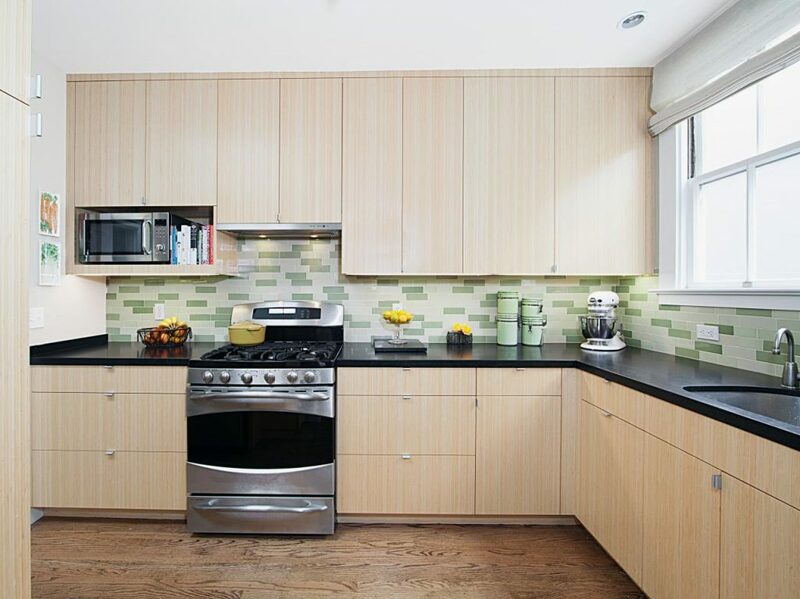 Rather than replacing their kitchen cabinets outright, many people are looking to options where they can simply cover their existing cabinets and doors with an artificial surface. Thermofoil, Laminate, and Melamine are all materials that can be affixed to the surface of wood or MDF doors to give them new life. The prices on all of these options vary but interestingly enough, you don’t seem to save that much more than you would by simply buying new cabinets with these affordable surfacing options. Thermofoil is the most affordable of the three options. To apply the surfacing, cabinet pieces made of wood or MDF are placed into a large flat tray. The tray is fed into a large machine where a thin malleable layer of foil-like material is heated and then vacuum sealed onto the surface. This process is very popular because it provides so many options for colors and patterns. 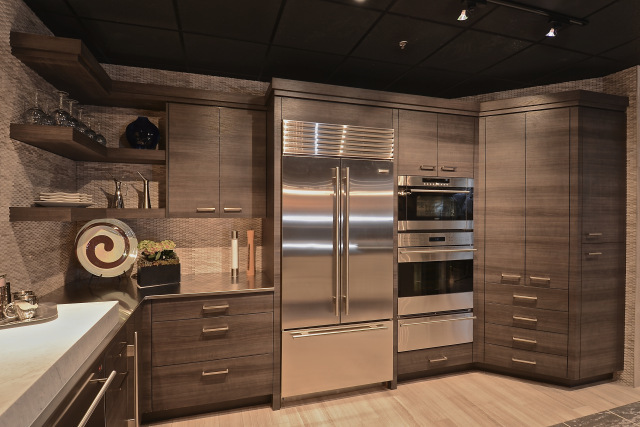 You can go with a faux wood grain or solid color or just about anything. Unfortunately Thermofoil does have a few down sides. With Thermofoil, you will always be able to only cover 5 of the 6 sides of an object. This generally means that the back side of the cabinet doors will be some neutral colored laminate that will not really match the rest of the door. 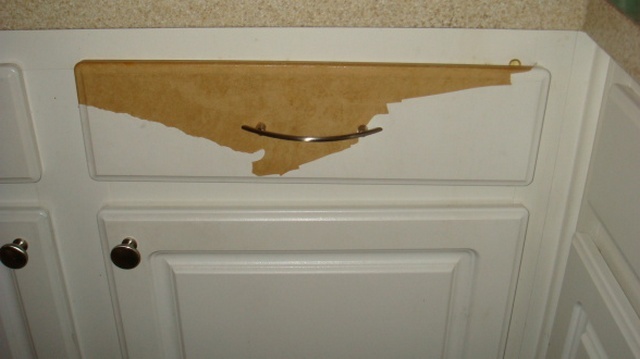 Thermofoil is also more susceptible to peeling away from the wood. It should also be noted that although most thermofoil cabinet doors are simple Euro style flat panel doors, it is certainly possible to use thermofoil on slightly more complex designs like shaker door or simple arches. Laminate surfacing can be very different depending on the quality of Laminate used. Laminate is basically a surface material that is made from paper and resin being pressed together under heat. The high pressure Laminate, (HPL) which is manufactured under 1400psi, will give you a better product that will chip and crack less than a low pressure laminate. However, the low pressure laminates cost less. So it is a give and take situation. Many quality RTA cabinets use laminate covered plywood for the body of the cabinets. A quality Laminate will hold to the wood without peeling. 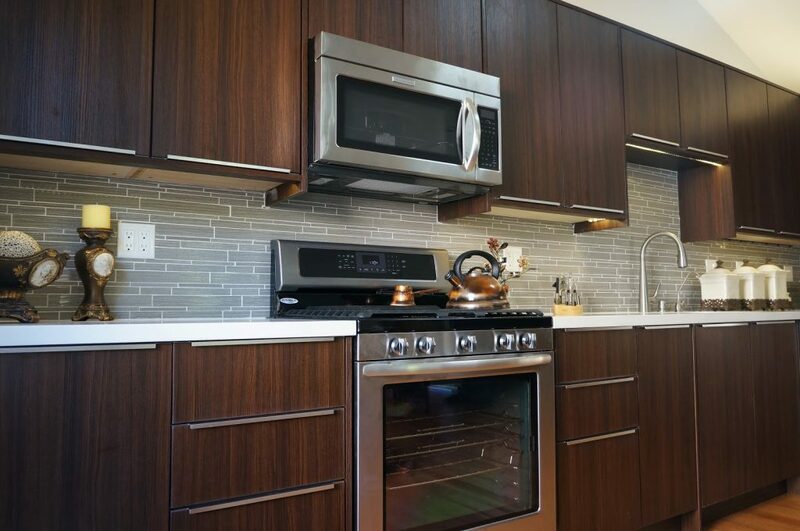 A cabinet door with laminate surfacing will last longer than a cabinet door that is surfaced with thermofoil. Melamine is a plastic coating material also used to as a surface for plywood and fiberboard. Although different enough to be considered a separate option, Melamine is technically a laminate product. Just like laminate, Melamine is made using paper and resin but the melamine costs less to produce. 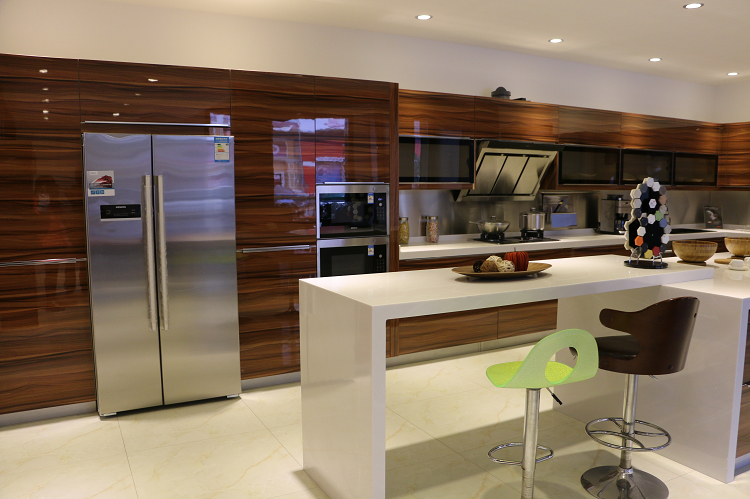 Also just like Laminate, the melamine surfaces have lower quality and higher quality products. The low quality melamine will not last as long as most laminate surfacing. However the thicker textured thermal-fused melamine has the same kind of life expectancy of high pressure laminate. Textured melamine opens up a lot of great options for your cabinets by giving a three dimensional texture to your doors. Various faux wood grains, bamboo, or other textures are available. One small thing to consider when making your decision about your cabinets is how they will look next to your countertop. If you have a countertop made of some natural stone or quartz then it will look great next to any choice. Tile and stainless steel countertops would also not be a problem. Many kitchen countertops are made from Formica which is actually a high pressure laminate product topped with a layer of melamine. This may not be a problem outright but if you have Formica countertops you might want to check to be sure that it does not clash with the look and texture of your chosen cabinet surface. All these options are worth considering for your kitchen. Natural wood cabinets are great but MDF doors with quality artificial surfacing can look fantastic and save you some money.